Very Good. 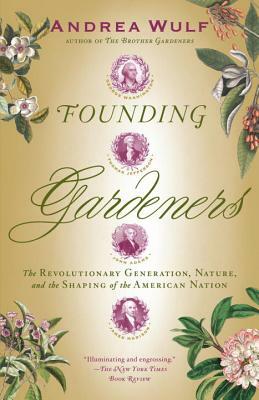 Founding Gardeners: The Revolutionary Generation, Nature, and the Shaping of the American Nation by Wulf, Andrea, 2012-04-03. Trade paperback (US). Glued binding. 368 p. Contains: Illustrations. New. Trade paperback (US). Glued binding. 368 p. Contains: Illustrations. Fine in very good dust jacket. Signed by author. Fine in Nr Fine dj, first printing this edition, inscribed/signed at Mount Vernon and dated by author. Glued binding. Cloth over boards. With dust jacket. Contains: Illustrations, black & white, Maps. Audience: General/trade. New. Sewn binding. Cloth over boards. With dust jacket. 349 p. Contains: Illustrations, black & white, Maps. New. 100% Money Back Guarantee. Brand New, Perfect Condition. We offer expedited shipping to all US locations. Over 3, 000, 000 happy customers. Trade paperback (US). Glued binding. 368 p. Contains: Illustrations. Fine. 100% Money Back Guarantee. Brand New, Perfect Condition. We offer expedited shipping to all US locations. Over 3, 000, 000 happy customers. Trade paperback (US). Glued binding. 368 p. Contains: Illustrations. New. Sewn binding. Cloth over boards. With dust jacket. 349 p. Contains: Illustrations, black & white, Maps. In Stock. 100% Money Back Guarantee. Brand New, Perfect Condition, allow 4-14 business days for standard shipping. To Alaska, Hawaii, U.S. protectorate, P.O. box, and APO/FPO addresses allow 4-28 business days for Standard shipping. No expedited shipping. All orders placed with expedited shipping will be cancelled. Over 3, 000, 000 happy customers.